Pinoy Thaiyo is now accepting advertisers! We are inviting business establishments, entrepreneurs, professionals and any organizations to advertise on our website. Be a partner with us and bring your company closer to your target market. We provide direct advertising links to your website (or email) and news-feature articles that will promote your company and its services with our very low introductory price per month. We have a growing readership from more than 25 countries including the Philippines, Thailand, the USA, Canada, the UAE, and many more. Advertise now! Be part of Pinoy Thaiyo, the first and only Filipino online magazine in Thailand. 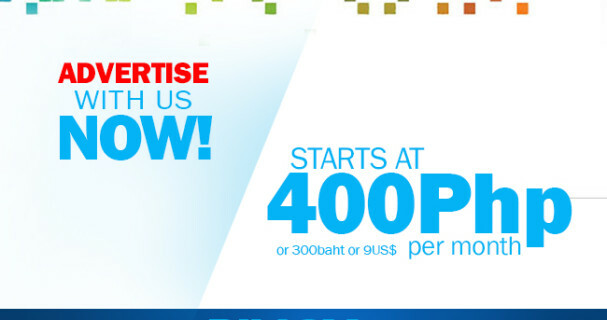 For more details, please contact: advertise@pinoythaiyo.com or call +66-99-219-0683.